Not all flag books are in agreement on when the various flags of Siam/Thailand were introduced. (...) In 1855 the chakra was dropped, leaving only the white elephant on the red field. Sources: Crampton 1992; Jos Poels 1990; Crampton 1991. The Flags of the Principal Nations of the World 1837 flag chart, printed by Hinnman and Dutton, shows Siam with a red field and a white disk in the center. (...) The flag next to Siam in my chart is Burma  a red field with a white elephant facing the fly. If anyone has a copy of Norie and Hobbs 1848 (or the German reprint, Norie and Hobbs 1971) they should check Siam out. During the reign of King Rama IV, Thailand signed more and more treaties with various Western powers. Realizing however, that plain red flags were used by several other countries as well, thus making it difficult to differentiate between them and the national flag, a white elephant was placed in the center, thereby creating a new national flag. The flag is dated 1855 but it appears in an 1848 flag book (Norie and Hobbs 1848). How does this fit? According to The booklet of Thai Flags, Thailand Fine Arts Department, 1977, the 1782-1817 and 1817-1855 flags were used as state flag together with the plain red flag as civil flag until the white elephant on red flag was introduced in 1855 by Rama IV. There are more than 15 flags displayed in the Church of St. Louis des Invalides (Paris). You can see a picture of the display. (eternal link - click on picture to enlarge). You may notice [...] a red flag with a white elephant, most probably a flag of the Kingdom of Dahomey. The flag is Thai, captured in a war between France and Siam (as it was then) in 1893. 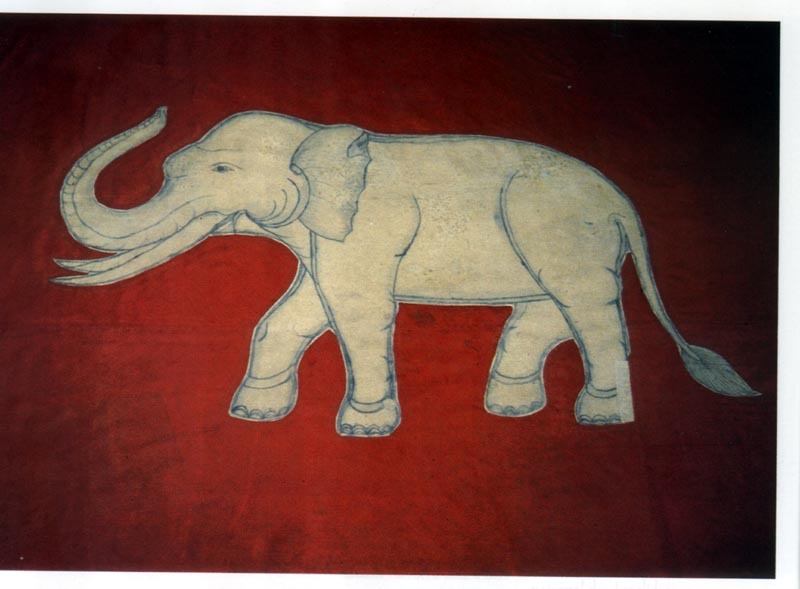 The sheet is red, 214cm x 326cm, the elephant is beige with the detail marked on the animal in brown ink or paint. I don't have any info. on what the flag was used for, but it is described as a 'pavillon' rather than a 'drapeau'. I'm sending a scan of the flag showing its appearance after restoration in the 1990s, taken from Revue de la Socie'te' des Amis du Muse'e de l'Arme'e, No.116 (1998) p.87. The national flag was changed again in the reign of King Rama IV. The King viewed that the plain red flag used by the private ships cannot distinguish Thai ships from foreign ships. So the King decided to remove the wheel and only the white elephant remained on the red flag. This national flag was used by both royal and private ships.